The answer is: in the stress system. Stress reactivity might be an important link between a genetic variant of the serotonin transporter gene, stressful life events in early years and depression. 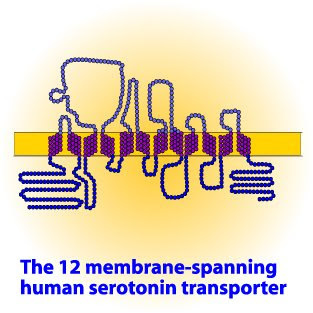 There is evidence of interaction between a functional genetic variant of the serotonin transporter gene and life events. Depression is not based on a simple gene or a cluster of genes. But on a gene and environment interaction. So the risk of getting a depression is higher when a certain genetic variant of the serotonin transporter gene is present in the presence of life stress, especially in early life. But how does this genetic predisposition and life stress lead to depression? Cortisol, a reliable indicator of hypothalamic pituitary-adrenocortical (HPA) axis functioning and stress reactivity has a hereditary component and is also elevated in 40%–60% of adults diagnosed with depression. How was this research done? Girls at high (n=25) and low (n=42) risk for depression by virtue of the presence or absence of a family history of this disorder were genotyped and exposed to a standardized laboratory stress task. Forty-two girls had biological mothers with no current or past Axis I disorder (low-risk daughters), and 25 girls had biological mothers with a history of recurrent episodes of depression during their daughter’s lifetime (high-risk daughters). 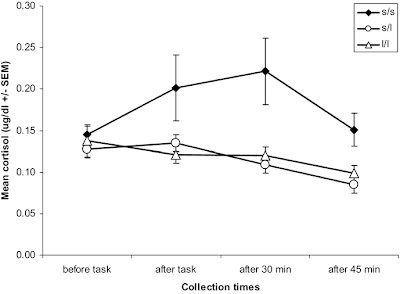 Cortisol levels were assessed before the stressor, after the stressor,and during an extended recovery period. The two groups of daughters did not differ significantly in their genotype distribution. Daughters who are homozygous for the s allele showed a marked increase in cortisol production during and following exposure to the stressor. In contrast, daughters with at least one copy of the l allele exhibited a slight decrease in cortisol production over the course of the stress session. These results explain in part why stress in some people can lead to depression and not in others. This is not a black and white outcome. Some people without the s allele can also get a depression but usually with a lot more stress compared to those with a s allele. Probably these findings can’t explain everything about the origins of depression but these findings sound plausible. They probably only apply to certain depressions such as melancholic depression and they probably differ based on ethnicity but nevertheless these results are encouraging to my opinion. Research into how the serotonin system plays a role in regulating HPA axis activity might shed some light on further mechanisms. Biological stress reactivity is a plausible mechanism underlying the association between genotype and exposure to life stress in predicting the onset of depression. In the future it might be possible to discover high risk individuals and develop treatment or prevention programs. This research will be very helpful in future for treatment and treatment of depression.